Fairtrade For Woodbridge has always felt that our local schools are important places to promote Fairtrade and help people understand the issues of trade justice, and felt this would be a great way of doing that whilst at the same time supporting our schools and the fitness of our local children and young people. Another 20 footballs were presented to Kyson County Primary School on Friday 17th March. 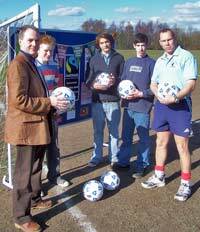 If you would like to have Fairtrade footballs presented to your school (providing it’s in Woodbridge) do get in touch with us. Alternatively, if you would like to contribute towards the cost of another set for another school, we would of course be very pleased to hear from you, as our funds are extremely limited! Please email us or ring 01394 382589. Saturday 7th May saw another Fairtrade Coffee morning in St John’s Church, Woodbridge. These are held twice a year: one in May called Café Olé, and another before Christmas called Café Noel. The purpose of these events is to give people a chance to come together and enjoy a relaxed café style atmosphere, whilst at the same time learning more about Fairtrade and seeing what sort of things are now available. 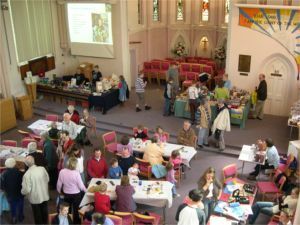 As well as being able to enjoy home made cakes and a choice of Fairtrade tea or coffee, people were able to browse the stalls around the church and buy anything that tickled their fancy. There were stalls selling beautiful hand carved animals and other artwork, Traidcraft products including a variety of foodstuffs, drinks, snacks and cards, and Tearcraft handcrafted gifts, jewellery and artwork. Cardcraft was also there, selling Christian books, music, and a selection of fairly traded cards and stationary. Children were also catered for, with a créche area for the little ones, and face painting and hair braiding on offer from Revival, the youth congregation of St John’s Church, who are raising funds for a mission trip to Romania this August. We held our own stall as well, offering people information about Fairtrade and our campaign to make Woodbridge an official Fairtrade Town, as well as projecting an informative slideshow throughout. The morning went very well, and a large number of people came along. As always though, there was plenty of cake left over, which went on sale at the end for people to take away! The next similar event at St John’s will be in late November or early December. We will advertise it on here as usual, and play a strong part in it. On the evening of Tuesday 11th January 2005, we were invited to give a presentation to Woodbridge Town Council about our campaign to make Woodbridge an official Fairtrade Town. We gave a twenty minute presentation and answered councillors’ questions afterwards, before leaving them to start their meeting. One of our members stayed for the meeting to see what response there would be. There was some discussion over the matter, which brought up some objections relating to the effectiveness of Fairtrade, but a vote was cast, and the motion was passed, with eight votes in favour, three against and one abstention. Fairtrade For Woodbridge is pleased with the response, and having the backing of the Town Council means another step has been taken towards becoming a Fairtrade Town. There is, however, still quite a way to go. 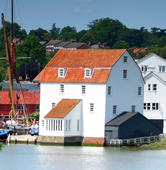 The Town Council are now officially supporting the campaign, but the backing of Suffolk Coastal District Council is also needed in order to gain Fairtrade Town status for Woodbridge. Fairtrade For Woodbridge, and individual consumers (the general public) also need to encourage more local businesses, retailers and catering establishments to stock and serve Fairtrade products. If you would like to help in this, please email us. We can provide you with literature and/or specially designed ‘Order Up!’ cards to leave with your local caterers and shop owners. Saturday 4th December saw the official launch of the campaign to turn Woodbridge into an official Fairtrade Town. 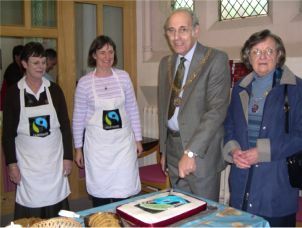 A special Fairtrade coffee morning was held at St John’s Church, with the Town Mayor Russell Geen in attendance. Many people came to this social and educational event, and enjoyed sampling Fairtrade products such as tea, coffee and chocolate, as well as a wide range of home-made cakes. 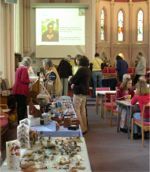 There were stalls set up around the church, selling Fairtrade and other fairly traded products, and offering information on the issues of trade justice, and the concept of Fairtrade Towns. At eleven o’clock the Mayor officially launched the campaign by cutting a specially made cake with the FAIRTRADE Mark on, after giving a short speech on the benefits of Fairtrade and the worthiness of the initiative. The local steering group, Fairtrade For Woodbridge, were delighted with the response and the number of people who attended. The following day, the group manned a stall at the Woodbridge Street Fayre, hoping to further raise awareness of Fairtrade and their campaign. They gave away free samples of Fairtrade products, and a selection of information sheets and booklets. Again, a higher than expected level of interest was shown, and another five hundred information sheets were snapped up. The weekend showed how there really is a lot of concern over the issues of trade justice, and many people are already actively buying and supporting Fairtrade. Others supported the concept but did not know where they could buy such products, which goes to show how important it is for more shops and catering establishments to start stocking them. The launch of the campaign has been extremely successful, and very encouraging to see just how many people are willing to see Fairtrade move into the mainstream market. Fairtrade For Woodbridge hope to carry on raising awareness of the issues it tackles, and encourage even more people and local businesses to consider switching to Fairtrade products, as quite simply, the more people buy Fairtrade products, the greater the number of producers in developing countries who benefit from Fairtrade will be.